Perfectly designed for overhead crane lifting applications, our Overhead Crane Rope 24×7 Non-rotating construction non-rotating wire rope is strong, stable and resistant to fatigue. Like all of our overhead crane rope, we manufacture lengths of the 24×7 construction wire rope to order, so whatever your requirements we can meet them. Rotation is a serious safety issue that overhead crane operators need to avoid. Thankfully this wire rope is constructed in such a way to prevent this from occurring. Each strand is aligned in a pattern that feeds into this design, with various diameters available starting at 8mm and going up to 19mm. The galvanised wires are resilient in the face of corrosion and so should be capable of performing consistently over extended periods in harsh environments. This should make servicing more affordable over the life of the rope and the crane. We produce wire rope for cranes of all types, including mobile cranes, dockside cranes, tower cranes and many other common kinds of load handling equipment. Our site is also the best place to find a huge number of other wire rope products, including fittings and a broad selection of other useful tools and accessories. Want help when Choosing Wire Rope for Overhead Cranes? Get off to a great start on your journey towards picking the ideal non-rotating wire rope when you contact the experts at Rope Services Direct. We can speak to you about your order when you call 01384 78004 or reply via email if you would prefer. 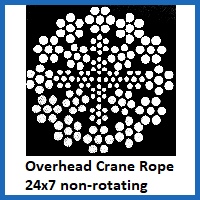 Overhead Crane Rope 24x7 Non-rotating Overall rating: 5 out of 5 based on 6 reviews.